is a Petri Net based CASE environment. It offers a set of services to perform specification, validation, formal verification, model checking, compute structural properties (invariants, traps, syphons etc.) simulate and generate code. These services have been implemented either by members of our team or university partners (Technical university of Helsinki, University of Torino, Technical university of Munchen, Bell laboratories). 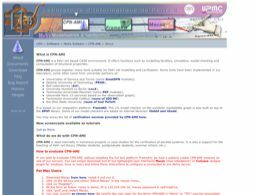 The second geration of CPN-AMI, build on top of FrameKit, is available on the Internet since March 1997.